We woke up against a backdrop of the breathtaking Rockies, inspired to continue our journey through Colorado. 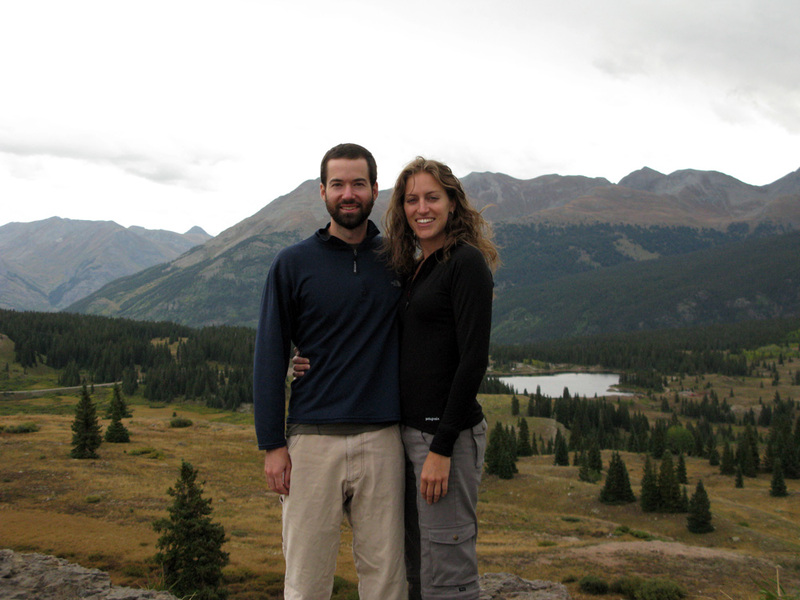 First we feasted on a big, delicious brunch in Pagosa Springs (a break from our usual oatmeal and yogurt/granola – although a hearty and tasty way to start the day) then headed West to Durango with the San Juan Mountains looming to our right. 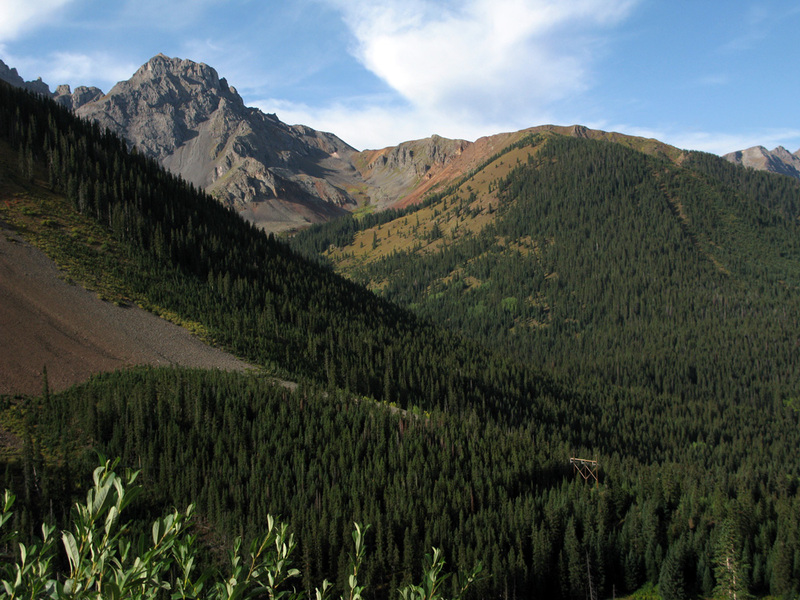 Some say the San Juans are the most beautiful mountains in Colorado due to their jagged peaks and cliffs, since the rest of the Rockies are a bit more rounded, albeit still stunning. We’ll let the pictures speak for themselves. 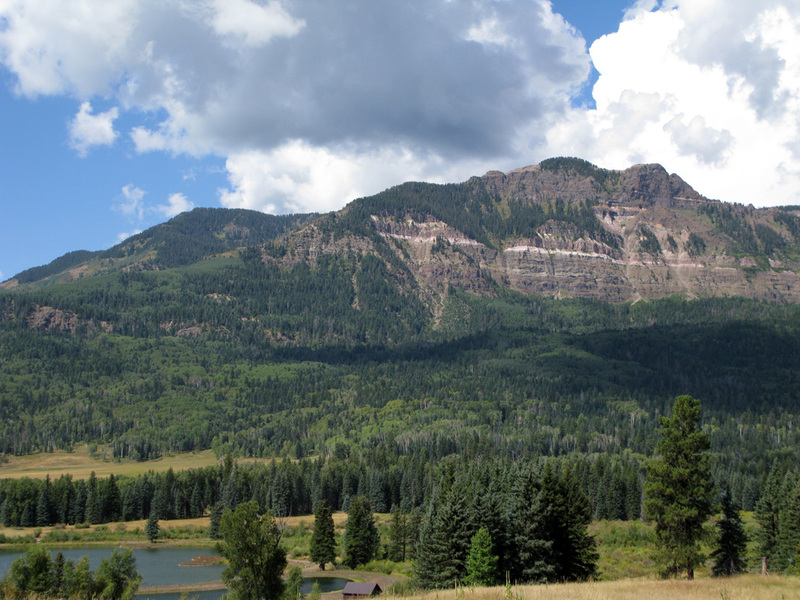 We stopped in the town of Durango and took advantage of a nearby organic co-op, where we bought a pound of ground Elk meat (we were in Elk country after all – when in Rome. . .) and a few other goodies for the week. Durango is a cute little town very reminiscent of downtown Frederick – though a bit larger – with abundant dining options; although we stayed away because we were heading to a little bit of paradise. . .
Waking up to the rockies. Mike and Kittybelle Hosford, fellow Fredericktonians and family friends, generously lent us their handsome mountain home for the greater part of a week. It was downright luxury after 1 month and a half of sleeping on top of our roof. We lived like kings for the next 4 days/nights, cooking meals in a fully-stocked kitchen, watching the US Open on TV, and reading books snuggled on the couch with a gorgeous view of the ski resort right across the street. 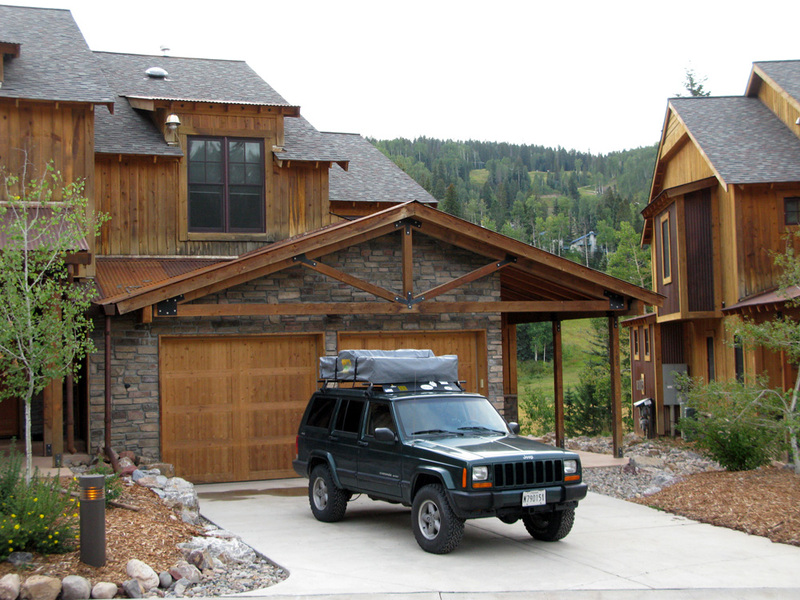 It was also the first time we completed unloaded the Jeep and gave her a little break, since she’s been so good to us. Also partly for selfish reasons since the Jeep would handle much better off-road over mountain passes with as little weight as possible. In fact, she did. The Hosford's beautiful mountain home. Durango ski resort across the street. 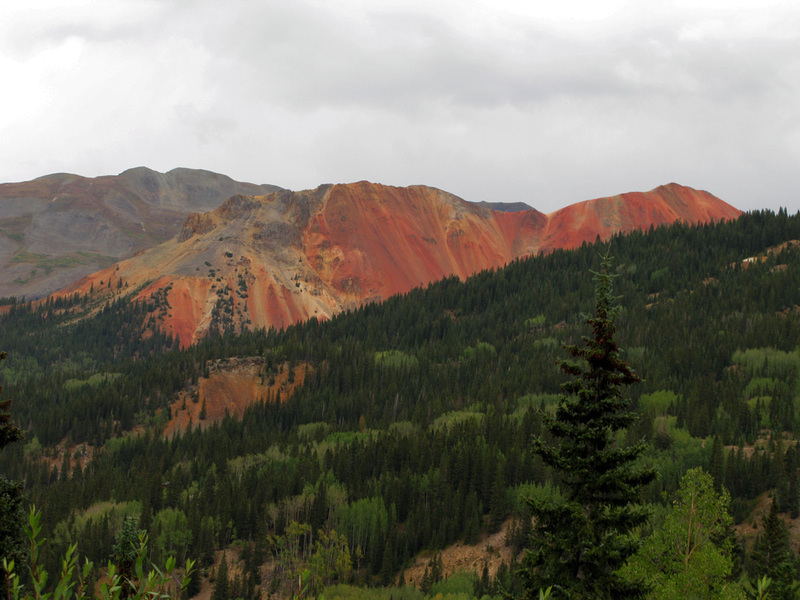 In the heart of the San Juan Mountains, we did what most prospectors did in the late 19th century: follow the Million Dollar Highway in search of precious ore (aka gold and silver). So, starting at the Hosfords, at Durango Mountain Resort near Purgatory, we went Jeeping and headed North on 550 towards Silverton, where we past a series of towering “14ers” (mountains above 14,000 feet – there are over 50 of these in Colorado), with aspens just starting to turn yellow and rocky cliff faces glowing a reddish-orange (iron oxide laden rock). 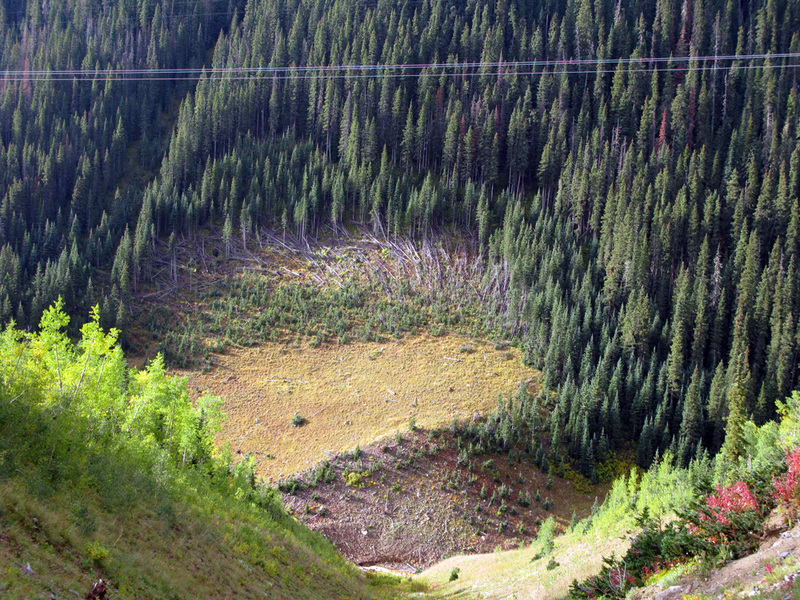 Although this road was paved, it wound through the mountains via switchbacks complete with steep drop-offs and no guardrails. However, this was nothing compared to what we would attempt later. Caro using her phone before losing coverage. 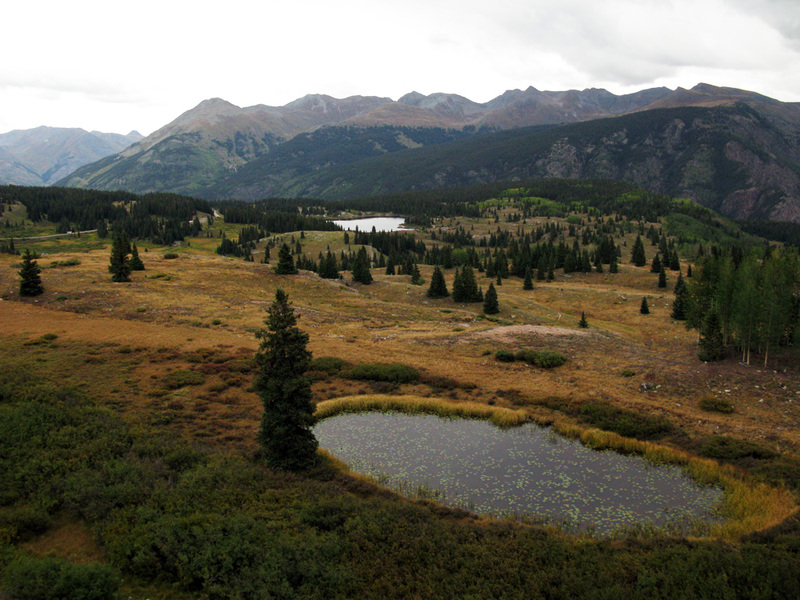 Molas Pass of the San Juan Mountains. 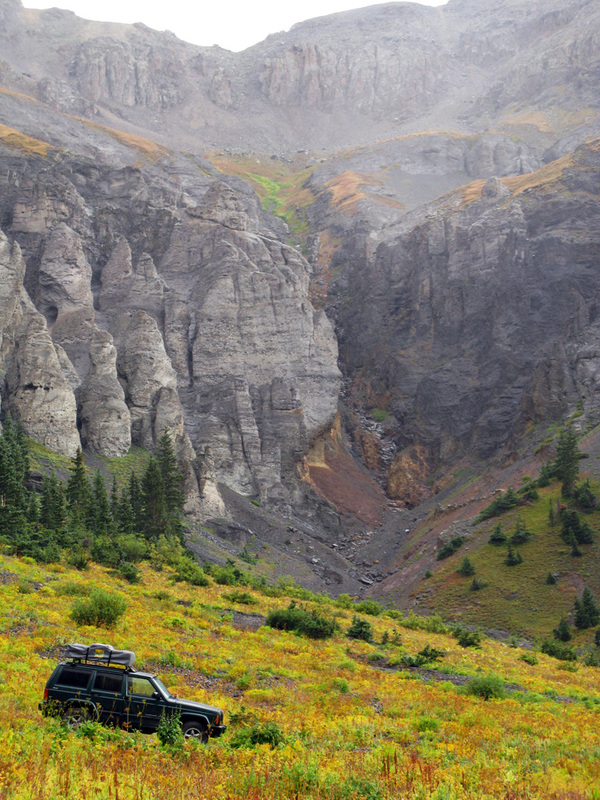 Against Molas Pass, traversed by the Million Dollar Highway. 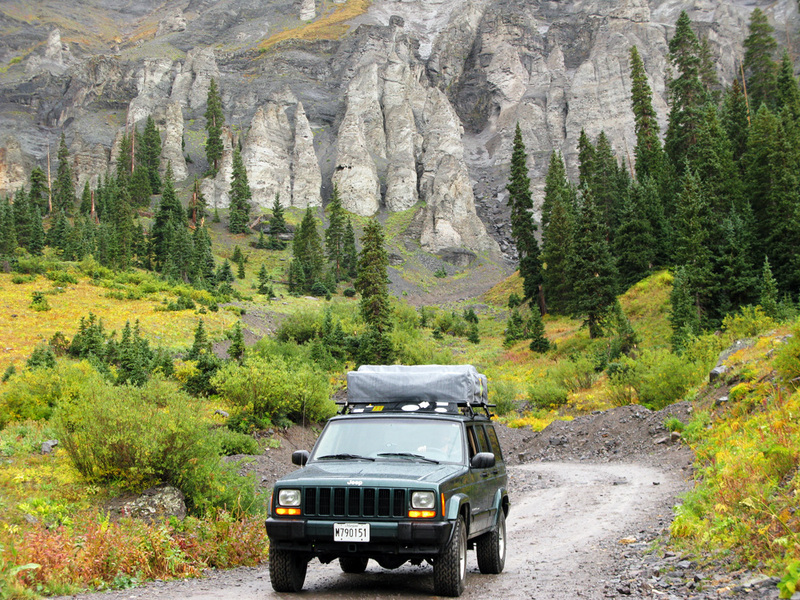 Jeeps, trucks and bikes all share the Million Dollar Highway. 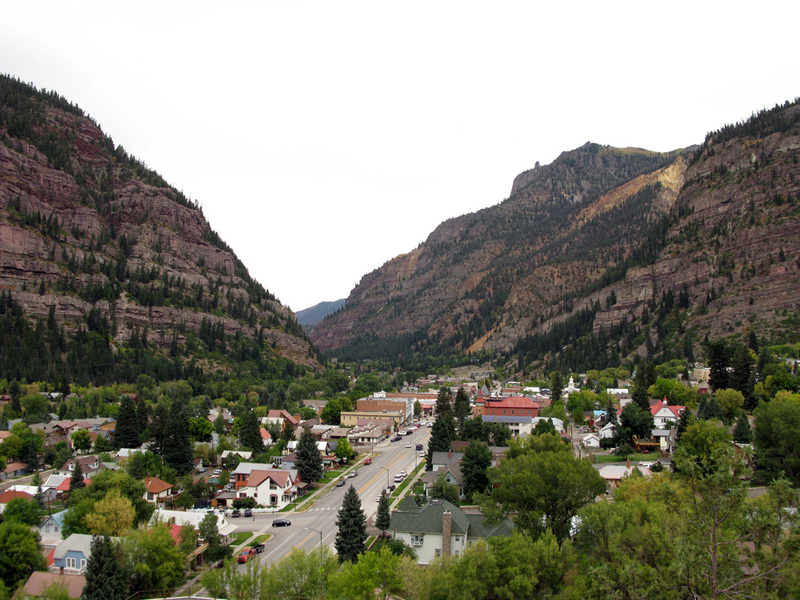 We arrived at Ouray, another old mining town in a small valley sandwiched between tall peaks, and were determined to take the most direct route to Telluride (origin of the name traces back to the old saying “to hell you ride!”): the off-road, high-clearance 4WD mountain pass called Imogene Pass. 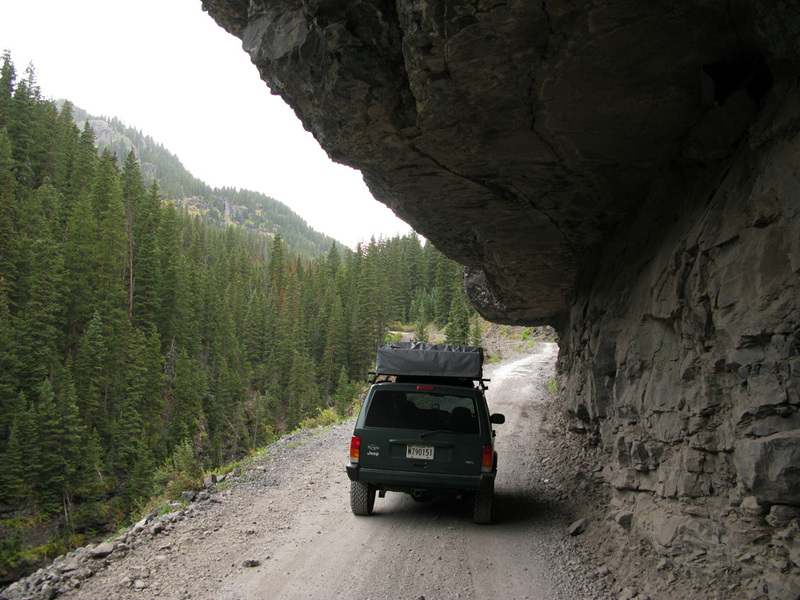 Although this pass was a bit more technical, Pat felt confident in the driver’s seat with the Jeep completely empty. So we gave it a try and climbed slowly up the rocky, single-lane switchbacks through rock overhangs and alongside sheer cliffs. Unfortunately we started our journey too late and afternoon rain and thunderstorms rolled in making the ground and rocks very slick – a bit of a hazard as you’re driving up hundreds of feet and have little buffer room. Ouray squeezed into the valley. 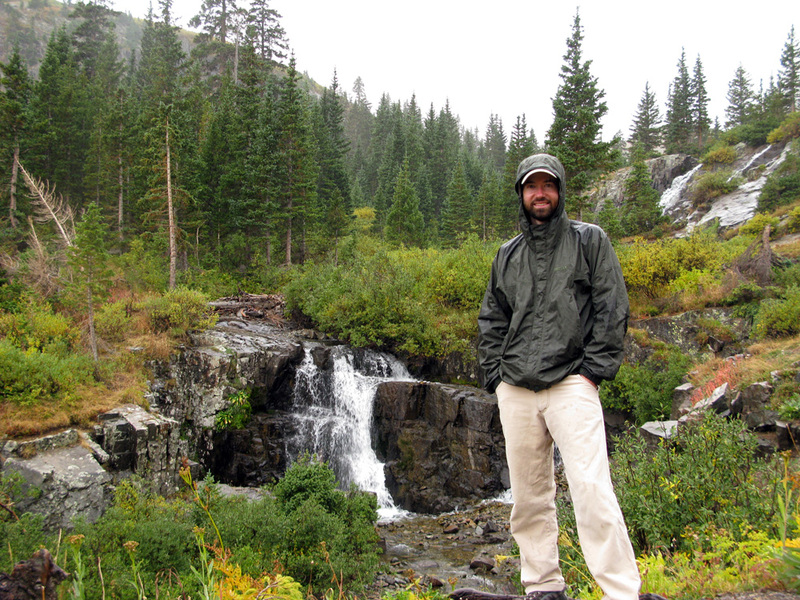 Caught in the rain, we abandoned Imogene Pass. We decided to turn back and instead follow a more moderate route towards Yankeeboy Basin. 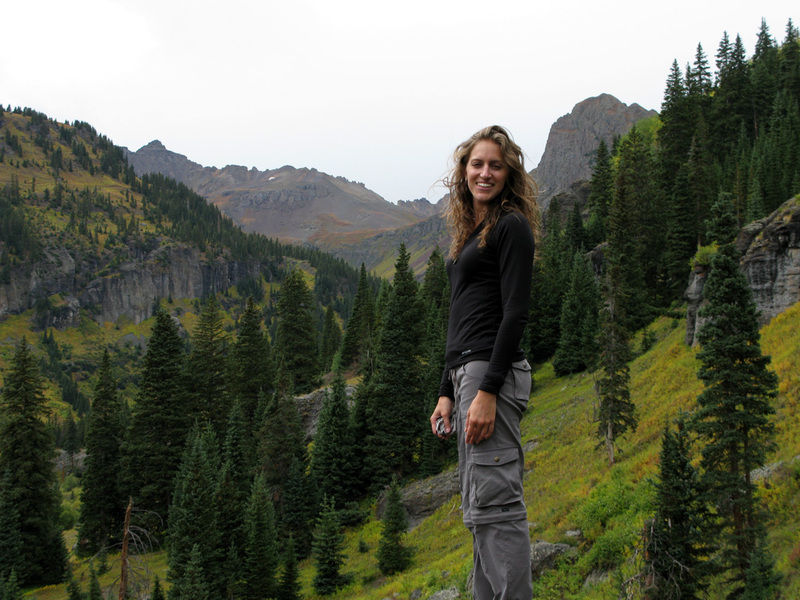 Here we were exposed to gorgeous scenery – a pine and aspen wilderness with rushing waterfalls and jagged mountain tops. 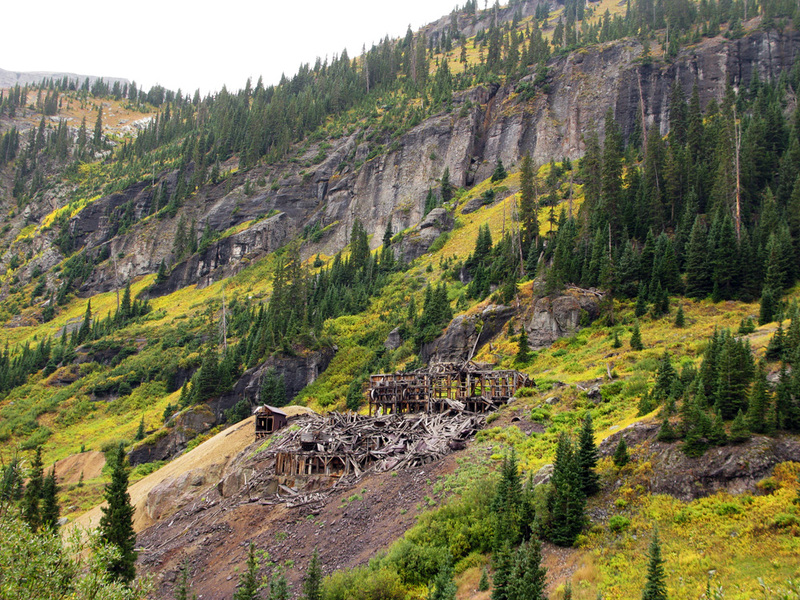 We also crossed paths with abandoned mine head-frames, remnants of the silver and gold mining heyday. At one time, a nice place to live, I imagine. We made it back to Ouray in one piece, had lunch and did a little window shopping. 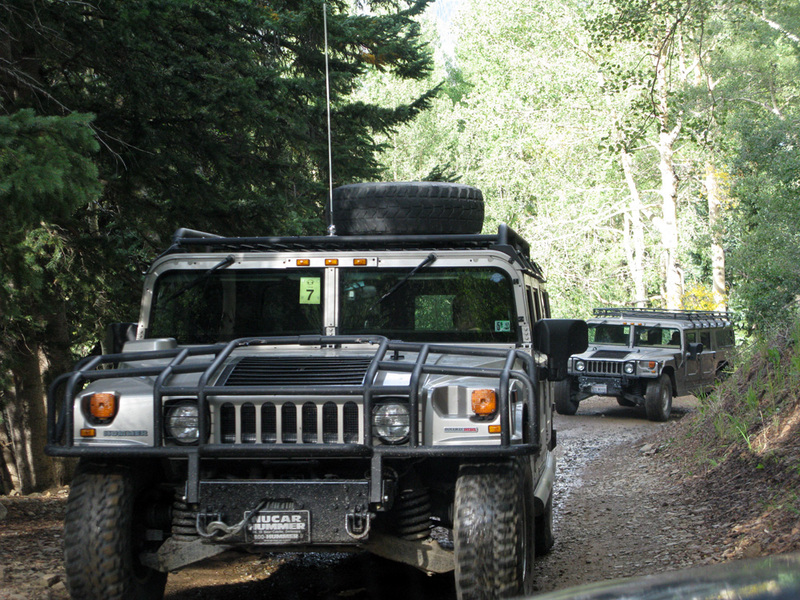 We also stopped by a Jeep Tour service and inquired about another, maybe tamer, mountain pass to follow on the way to Telluride. There we received good info, well-armed for the next journey. We returned to the Hosfords happy to sleep in the King-sized bed. The trail down Yankeeboy Basin was slick and steep. 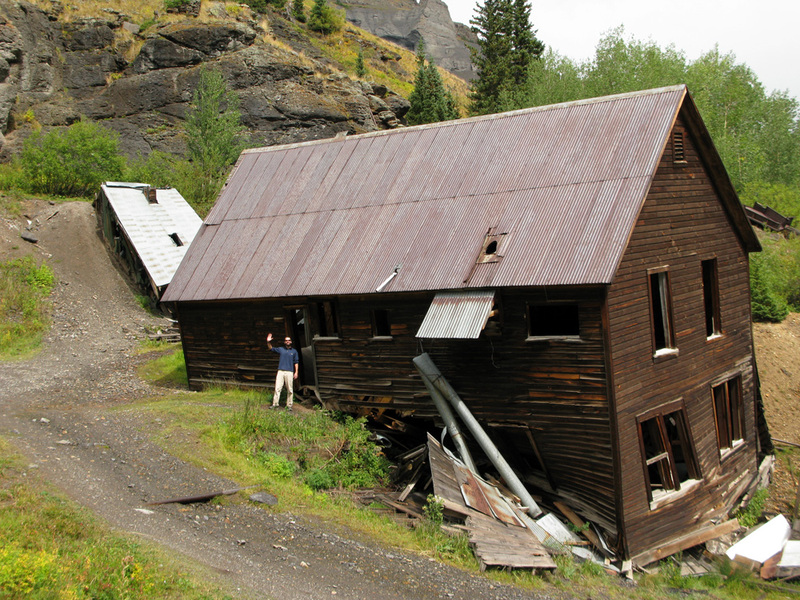 We found our new home - it's a fixer upper. . .
. . .but what a backyard! While in Durango, we also took advantage of the local attractions. 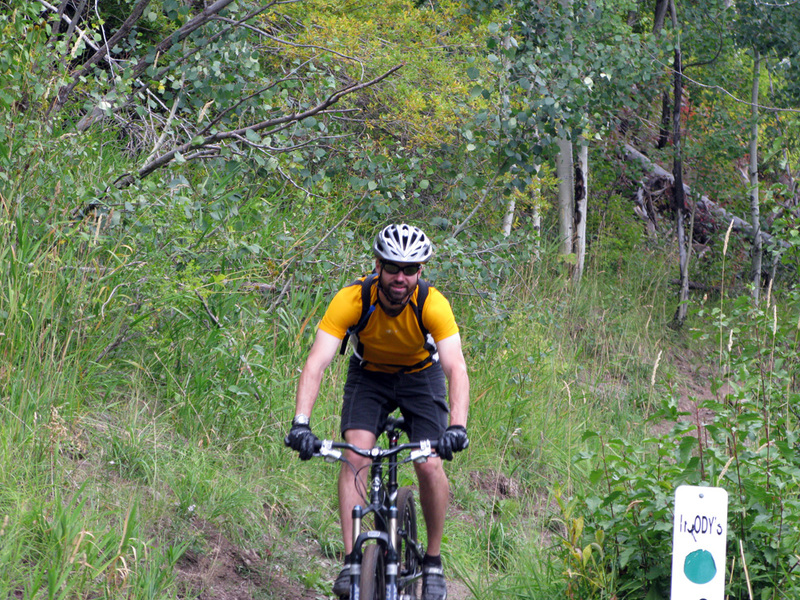 With the ski resort right in our backyard, we had immediate access to a network of mountain biking trails – most too difficult for me – so I let Pat test them out first and we opted for more novice trails. They turned out to be quite fun with a few challenging spots. After a good ride, we were back at the house in minutes ready to cook our long-awaited meal: fresh ground elk. It turned out to be quite a success. We sautéed some portabella mushrooms and fresh basil, added the elk and wrapped the meat mix, tomatoes and feta cheese in a tortilla. Quite delicious! Actually, that elk meat lasted us for 3 other meals! Pat on the Hoody's trail. Caro motivated by the scenery. 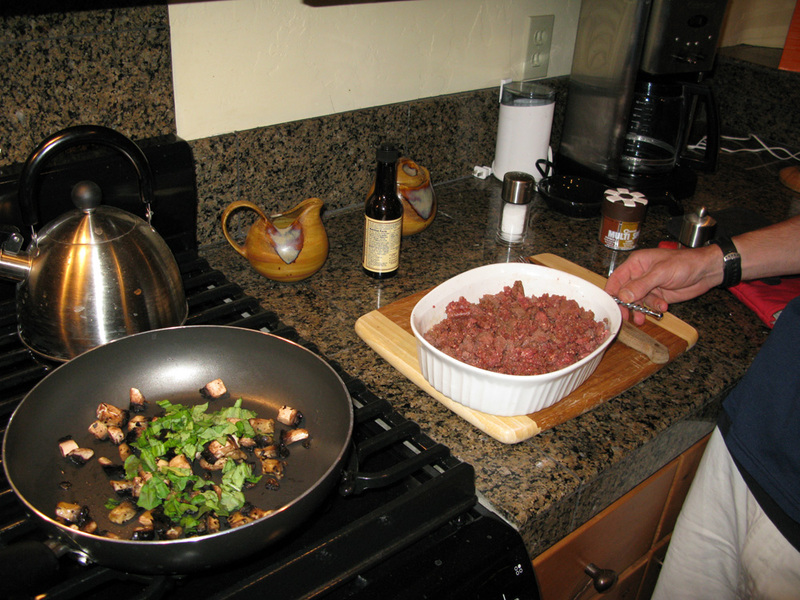 Our elk meat, with mushroom and basil nearby. 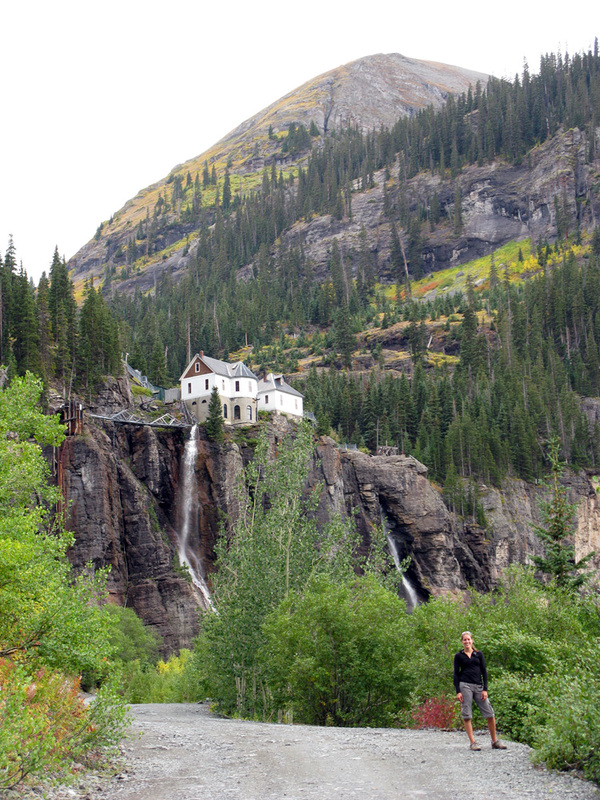 We had also hoped to climb aboard the Durango & Silverton Narrow Gauge Railroad for a historic and scenic ride through the San Juan mountains, but it clouded over, so we went for a scenic hike instead through the Weminuche Wilderness with hopes to see the train passing along the Animas river. Clouds led to rain, so alas, we retreated without reaching the train tracks. This ended up being our last day/night in Durango. We were sad to leave our palatial abode, but were thoroughly rejuvenated after 4 days (along with our clothes, linens and Jeep), and decided to continue on. Thank you so much Mike and Kittybelle for sharing your home with us – it was such a treat to stay in an impeccable house in such a beautiful spot! 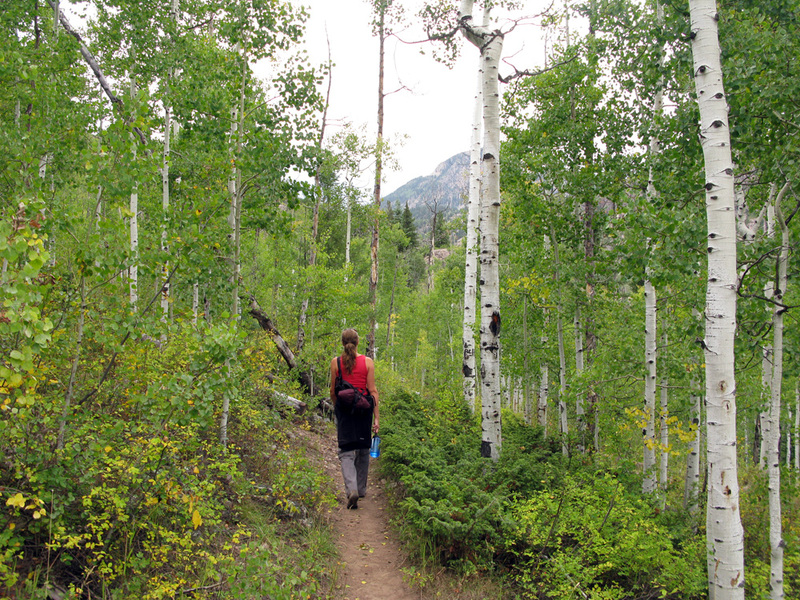 Trekking through the aspen forest. 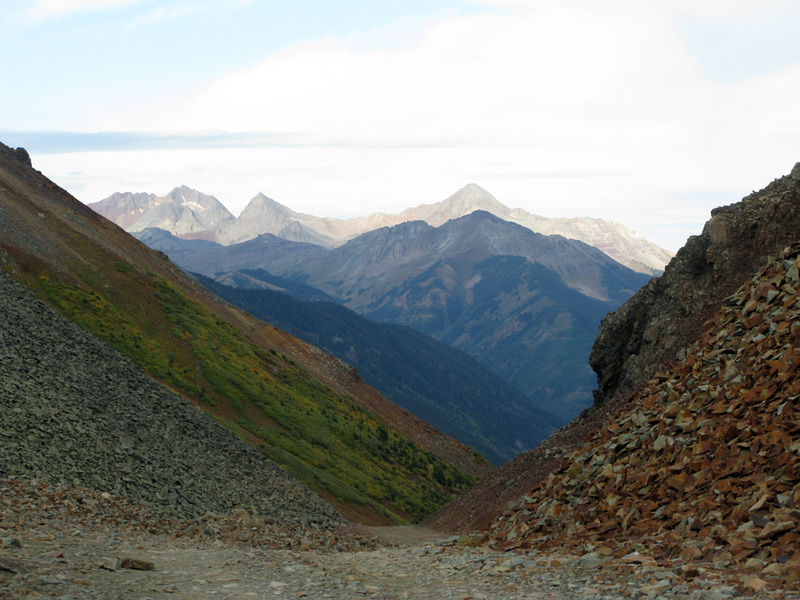 With all the weight back in the Jeep, we continued our off-road adventure through the San Juans and this time followed the Ophir pass. 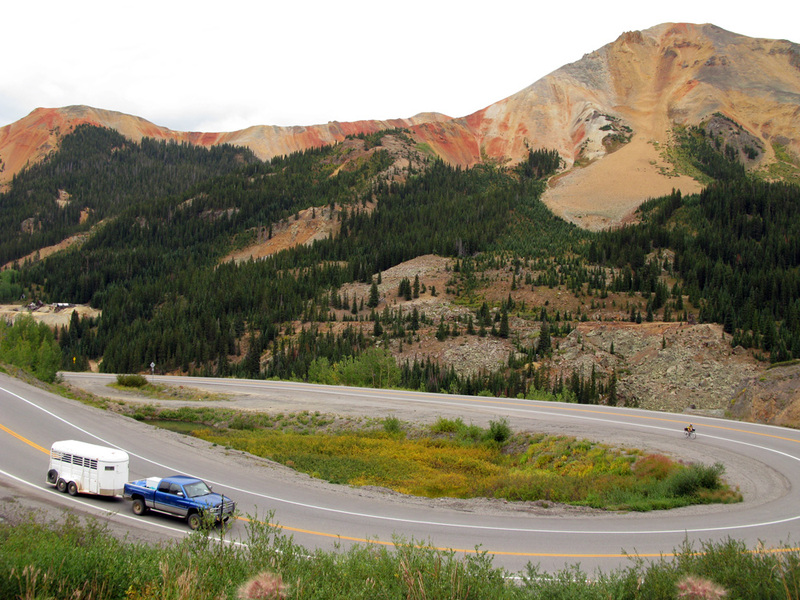 A less technical but nevertheless strenuous drive starting just north of Silverton going west to the small town of Ophir. 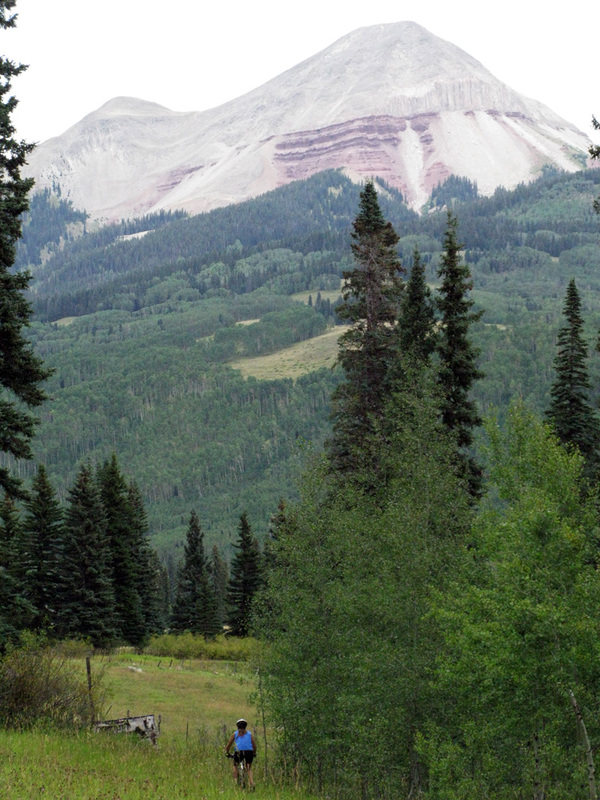 From there we could continue on north to Telluride. 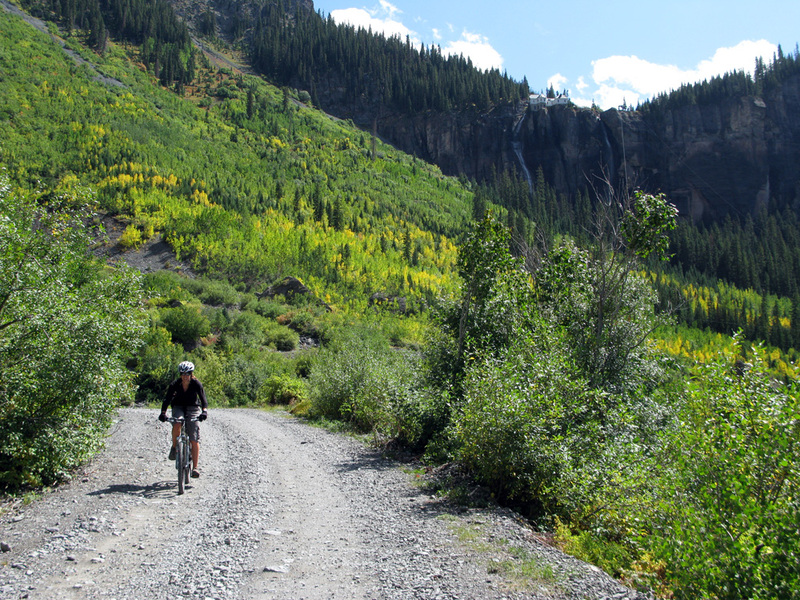 This was the second most direct route to Telluride, though significantly shorter. 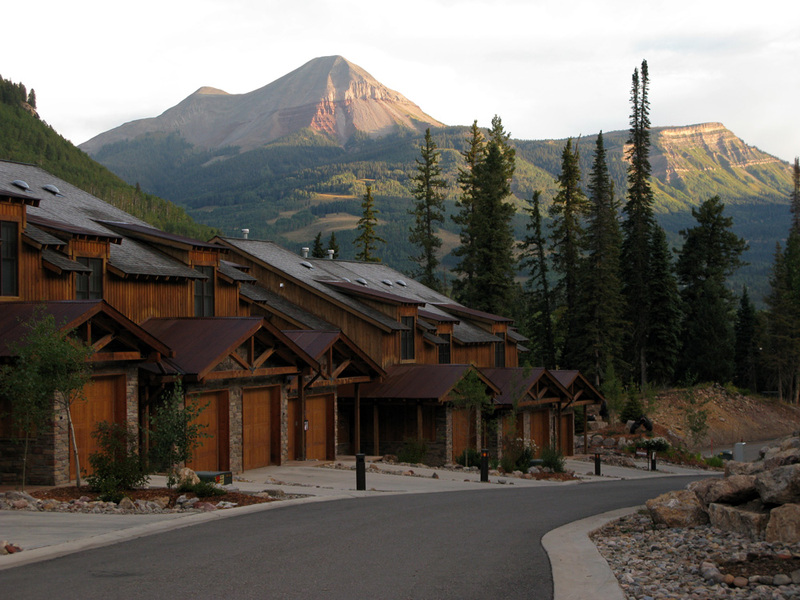 We were greeted with clear skies and even more beautiful sights of the mountains. We also wizened up and left the house in the early morning, anticipating both afternoon thunderstorms and Saturday traffic. We were alone for most of the drive up the mountain and stopped frequently to take pictures of avalanche paths, the narrowing road and the beautiful skyline. We barely missed the mid-morning traffic on the way down as a caravan of 12 hummers passed us on the other side. Yes, twelve! Oh and also a few dirt bikes. Silverton in the morning sun. Avalanche slide path - so big it goes up the other side of the mountain. Evidence of rockfall on both sides! Other trucks braving the treacherous pass. 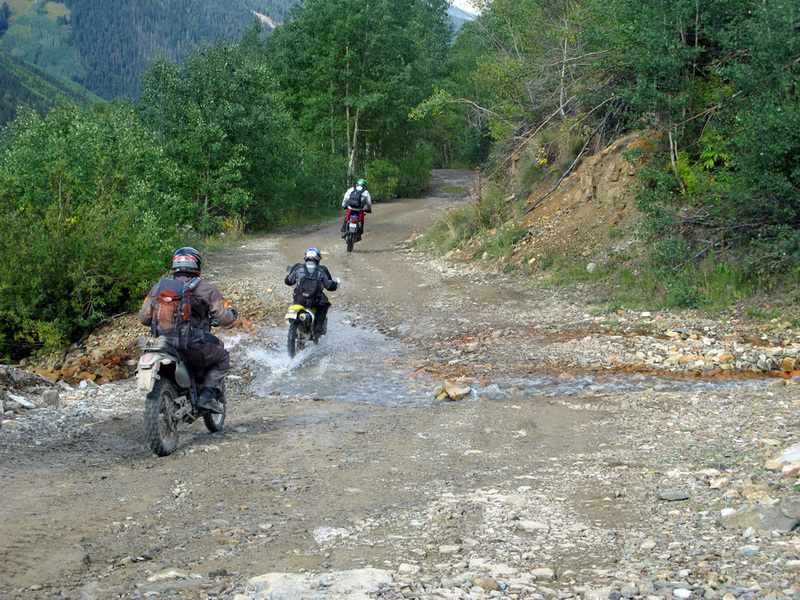 One of the water crossings coming down the pass. We arrived in Telluride late morning, just in time to see the brave contestants in the Imogene Pass Run make it through the finish line. 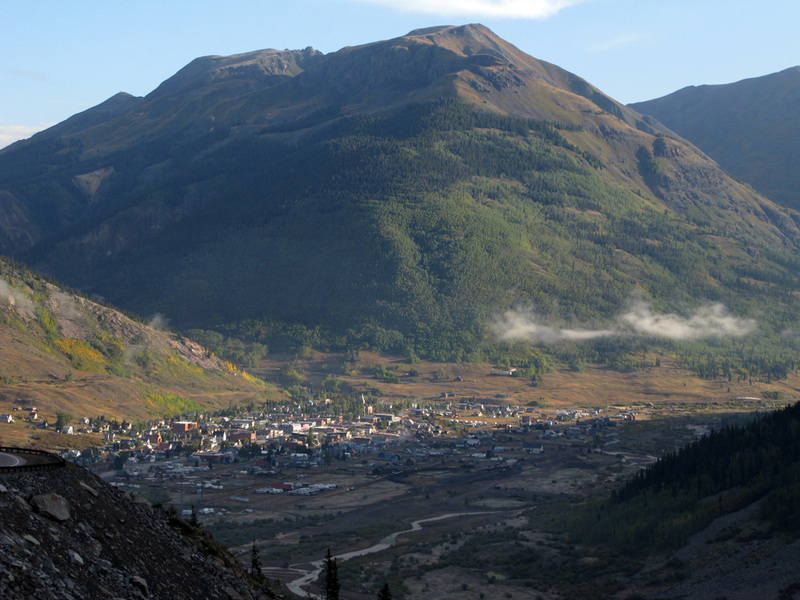 Every year, for the last 30+ years, runners take mark in Ouray and begin the 18-mile journey up and over the mountains to Telluride. 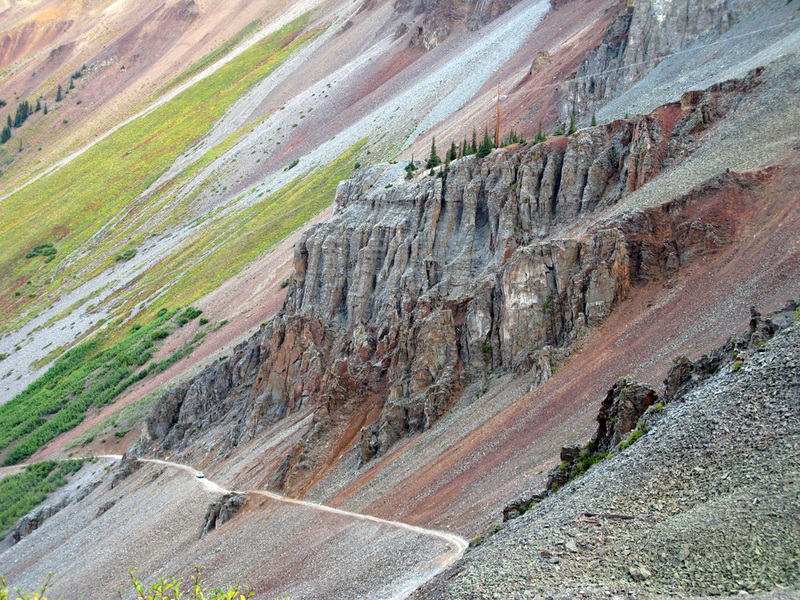 So while Pat and I had difficulty driving up the Imogene Pass, low and behold athletes tackle it on foot! Quite the herculean effort that requires the utmost acclimatization. Having exerted far less effort, we hit a nearby saloon and downed a sumptuous eggs benedict breakfast! 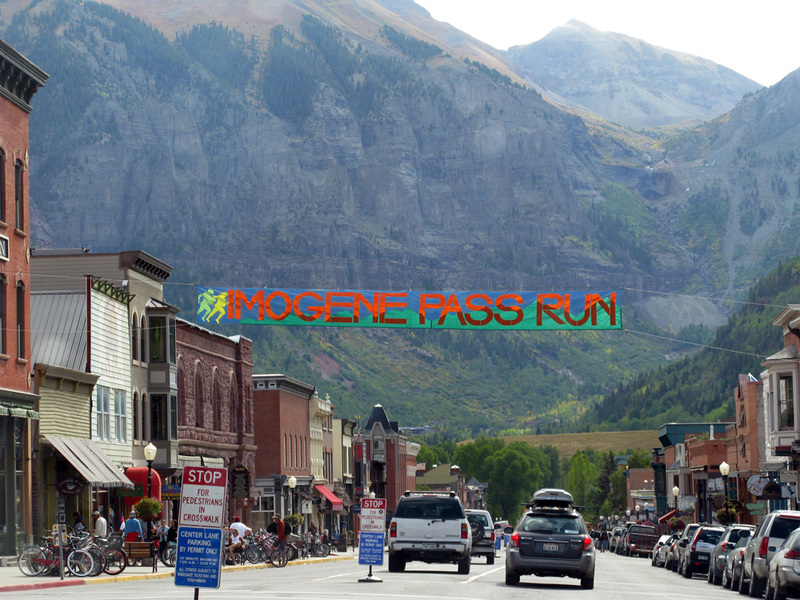 The Imogene Pass Run finishes in Telluride. 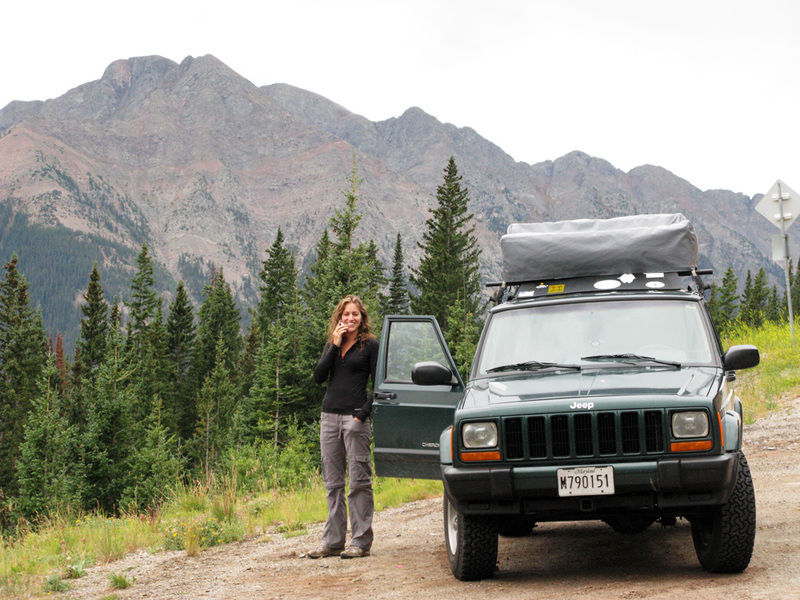 After walking and exploring this delightful town, we set up our tent in a campground situated right in town, which gave us the luxury of leaving the Jeep and tent, since everything was accessible by foot or bike. We met some great guys and excellent riders – Todd and Ron – next to our camp site who offered sound advice on where to eat and ride and even showed us a few spots in person. 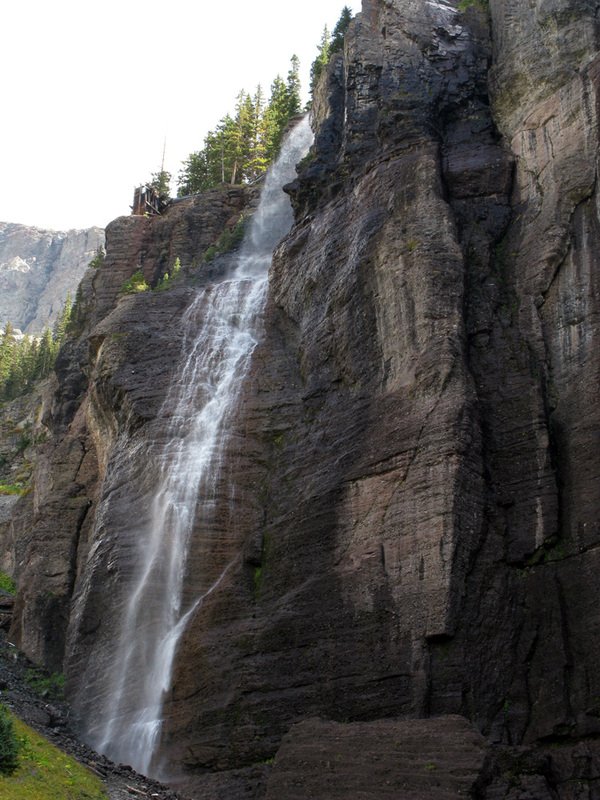 During the day Pat and I went for a bike ride to see the Bridal Veil Falls, a 365-foot waterfall at the end of the boxed canyon behind Telluride and past the still active Pandora Mine. We didn’t quite realize how steep it was going to be, but continued to ride the 2 miles of switchbacks uphill until we got to the base of the halls. There we dismounted and continued on foot until we reached the power plant at the top. 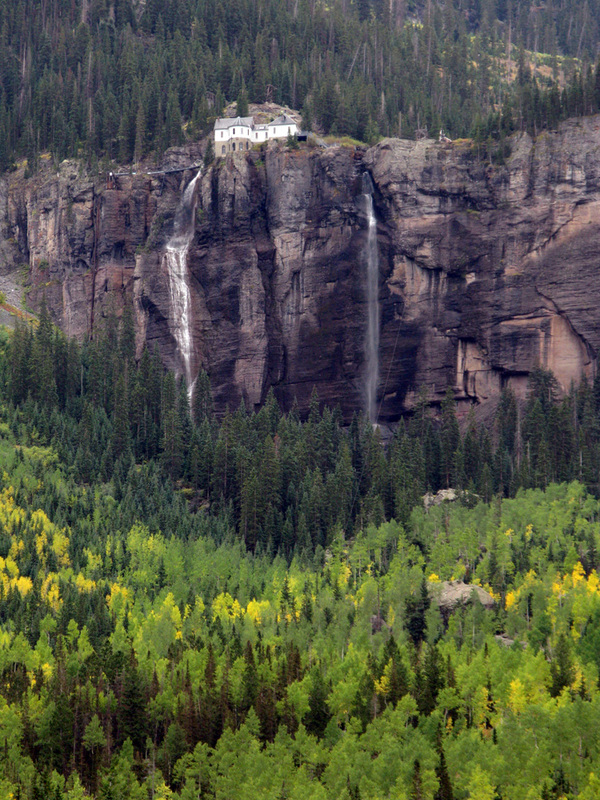 It is actually the second oldest hydroelectric plant in the US, and still provides about 25% of Telluride’s electricity. 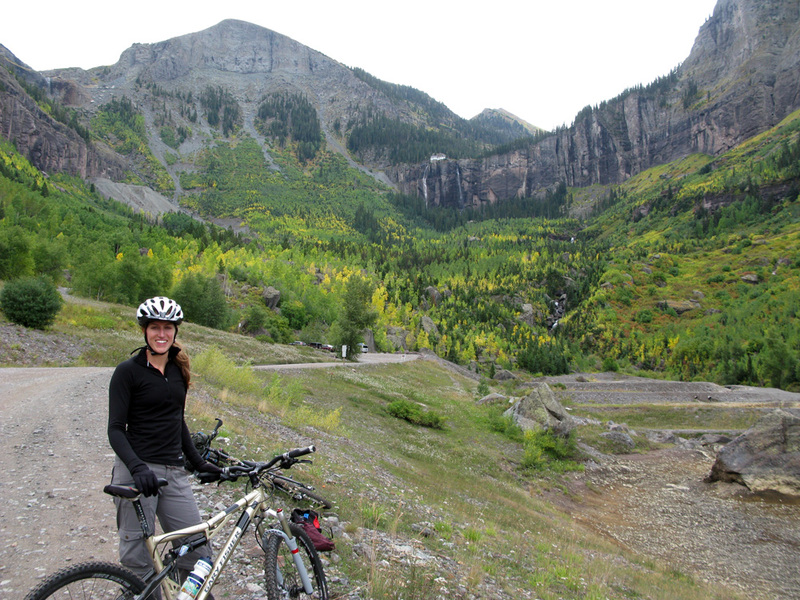 Great views of Telluride from up there! We cruised on down quite effortlessly. Taking a break on the way to Bridal Veil Falls. The rest of the way on foot. At the base of the falls. A little bit of Switzerland. Caro gaining confidence on the trail. That night we joined Todd and Ron on a ride up the free gondola to Allred’s restaurant situated at the top of the mountains, and with a clear view of the town in the valley and surrounding peaks. There they treated us to fantastic happy hour drinks (Bellini-tini, Dark & stormy, etc.). Thanks again guys! The Gondola is actually the only transportation system of its kind in the US. 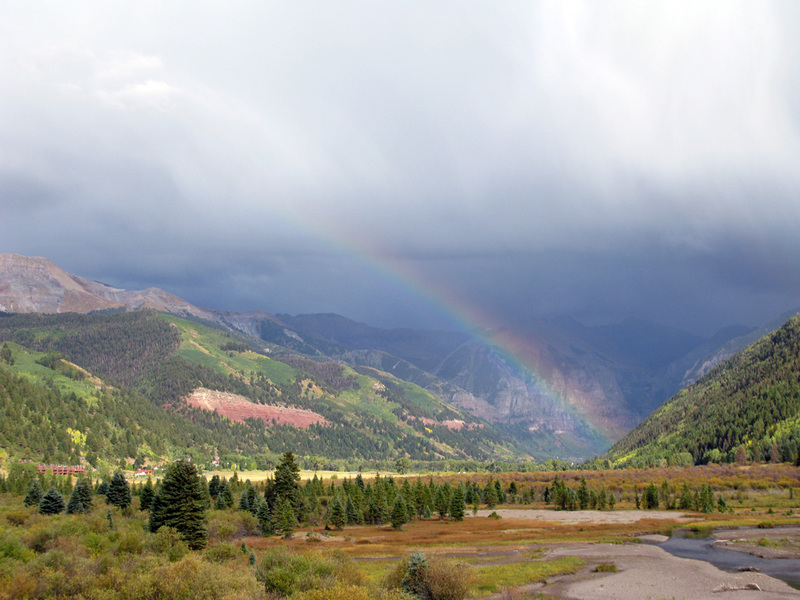 It connects the town of Telluride with Mountain Village (ski resort) and runs every day except for one or two odd months –for free – until midnight. An environmentally sound alternative to car traffic and pollution. The next day Pat was itching to go on a more epic ride, so he, Todd and Ron went off on their own for some real mountain biking. I happily stayed behind and spent a few hours in the renowned “Baked in Telluride” bakery eating and reading. The food was delicious and inexpensive – one of our favorites so far! After their ride, we went out for one last meal in Telluride with our new friends and bid them farewell before we continued our journey south towards Mesa Verde! I check it every few days, love hearing about your adventures. Absolutely beautiful!! You are so lucky, this seems like an incredible journey. I miss you! We are headed to Frederick in a couple weeks and you won’t be there! But, I am so happy you both are having such a great time. I love you guys and can’t wait to see more (I have to admit, I don’t have a ton of time so I can only usually scroll through the pics. But, I love reading your words when I can!) Be safe! Glad you are experiencing them to the fullest! 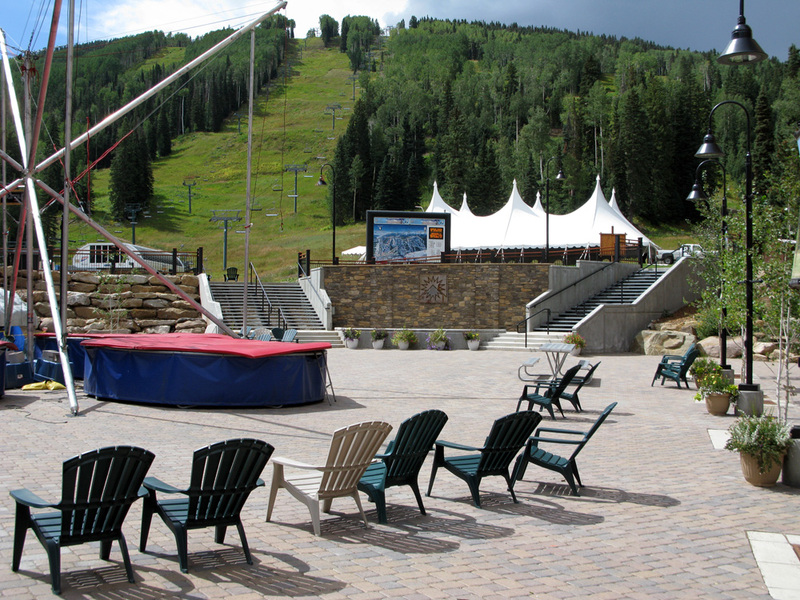 The aspen trails must be quite awesome. Beautiful! From your itinerary, it looks like we’re going to get to and from Phoenix way before you get there: Oct 10th, then Grand Canyon, then leave 14th or so. We’ll definitely see you in SA. Love your blog and you. The trip looks wonderful and we’re enjoying it through your eyes.